Houston, TX – Evelyn Rubenstein JCC of Houston presents the 39th season of Dance at the J, showcasing prominent choreographers, master teachers, companies and dancers. Dance community outreach, audience expansion and professional artistic development are continuing goals of the program. Dance at the J continues its tradition of presenting choreographers at Houston Choreographers X6 on Saturday, Feb 16 at 8:00 PM. Dance artists Stacey Allen, Jennifer Mabus, Kristy Nilsson, Donald C. Shorter, Jr., Dwain Travis and Shizu Yasuda are this year’s choreographers selected to present original works ranging from Ballet to Modern. Joining the choreographers will be special guest Uptown Dance Company. 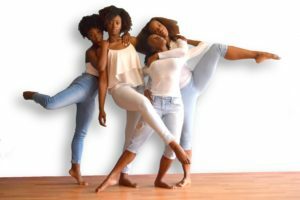 After years of performing, Stacey Allen dives into choreography and directing with “Dear Little Black Girl,” which is an introspective narrative of the lives of four black women. Each character has unique, yet relatable experiences. This is a universal coming-of-age story of self-love, womanhood and spirituality. Ms. Allen has been a company member for Urban Souls Dance Company, earned a BA in Dance from Sam Houston State University and an MA in Cross-Cultural Studies from University of Houston Clear Lake. William Blake wrote, “If the doors of perception were cleansed, everything would appear to man as it is….” Thus, Jennifer Mabus’ work reflects our attempts to understand another’s experience. Mabus’ articulate exploration of contemporary technique combined with emotional expressiveness and interactive technology asks the viewer to examine how we truly perceive experience. Mabus received a BFA in Dance from Southern Methodist University and an MFA from Sam Houston State University and currently has been named the director for the newly-established dance program at the University of St. Thomas. Kristy Nilsson’s new contemporary ballet, “Humanity, As Seen From the Moon” is set to the ethereally emotional music of Italian minimalist composer Ezio Bosso. The work explores the fragility of humanity and our capacity to find strength through our most beautiful attribute: our ability to love. Kristy trained at Ballet Center of Houston and the High School for the Performing and Visual Arts. She performed with Atlanta Ballet and Charleston Ballet Theatre and has choreographed more than 125 concert works. Donald C. Shorter, Jr. was inspired to create his piece while hiking. “The protection I found among the trees, grass, hills and open air was what I had been searching for quite some time,” stated Shorter. The dance takes place in an enchanted forest where we meet a community of people who connect through dance, music and nature. Shorter is a former company member of Bill T. Jones/Arnie Zane Dance Company and is currently an Assistant Professor of Dance at Sam Houston State University. Alaina Graiser, an avid performer, researcher and teacher, is the live accompanist. She is an adjunct instructor of harp at Sam Houston State University. With Dwain Travis’s new work, Green Glass Showers, he strives to create a distinctive movement vocabulary by exploring and pushing the boundaries of what we usually perceive of classical dance genres while manipulating the relationship and juxtaposition of the dancers with the sound score. Travis, a Houston native, began training at the Kirov Academy of Ballet in Washington DC and started his professional career with a company in Houston, BAHBT. Most recently he became a co-founder and choreographer for Juxtapose Arts Collective as well as a company member of Houston METdance. Shizu Yasuda said, “Living the dream is one of the most significant themes for humankind.” But how many are living their life to its fullest? What is stopping us from achieving our dreams? “Master Mind” is about how our master minds are formed to accomplish the vision of our hearts. Yasuda is the Artistic Director and Choreographer of Ad Deum II Dance Company. While she is directing, she is also freelancing as an independent choreographer. Our special guest Uptown Dance Company will perform excerpts from Krissy Richmond’s work “Life is Just a Bowl of Cherries.” The work pays homage to the classic jazz dance made famous by masters such as Jack Cole, Luigi and the incomparable Bob Fosse. Upbeat, energetic and evoking the golden age of classic jazz dance, the audience gets to experience a style of dance not often performed in Houston. Krissy is a former principal dancer with the Houston Ballet. She won Houston Press Awards for Best Choreography in 2017 for Godspell and again in 2018 for Cabaret. Dance at the J is funded in part by the Evelyn Rubenstein JCC Patrons of the Arts, a grant from the City of Houston through Houston Arts Alliance and RBC Wealth Management. Marriott Houston Westchase is the official hotel for Dance at the J. Dance concerts take place in the Kaplan Theatre, I W Marks Theatre Center, The Gerald Rauch Cultural and Performing Arts Wing at the Evelyn Rubenstein JCC. To purchase tickets online visit www.erjcchouston.org/dance or call 713.551.7215. Find us on Facebook, Instagram and Twitter.